This page gives very brief descriptions of cycling climbs I did, or Tanya and I did on the tandem, in July and August, 2014. We took a road trip to Utah, then Wyoming, back to Utah, finishing in California. All the climbs are from the second edition of John Summerson’s book, The Complete Guide to Climbing (by Bike), and if the climb is in Summerson’s top 100 climbs, I’ve shown Summerson’s rating. For example, #14 means Summerson rates the climb as the 14th hardest in the U.S. Besides the difficulty ranking, I also show the difficulty number, and the number of feet climbed for each ride. 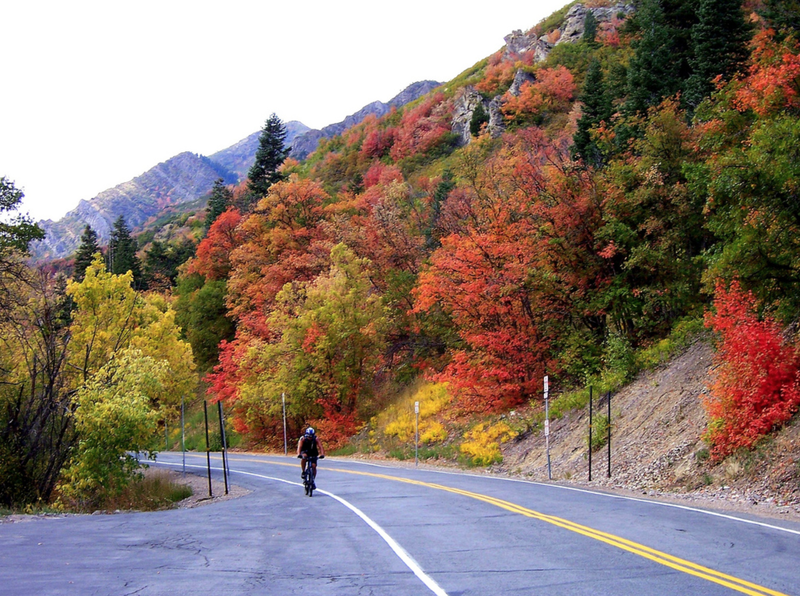 For example, Big Cottonwood Canyon gets (#35, 3.01, 4,814′)). 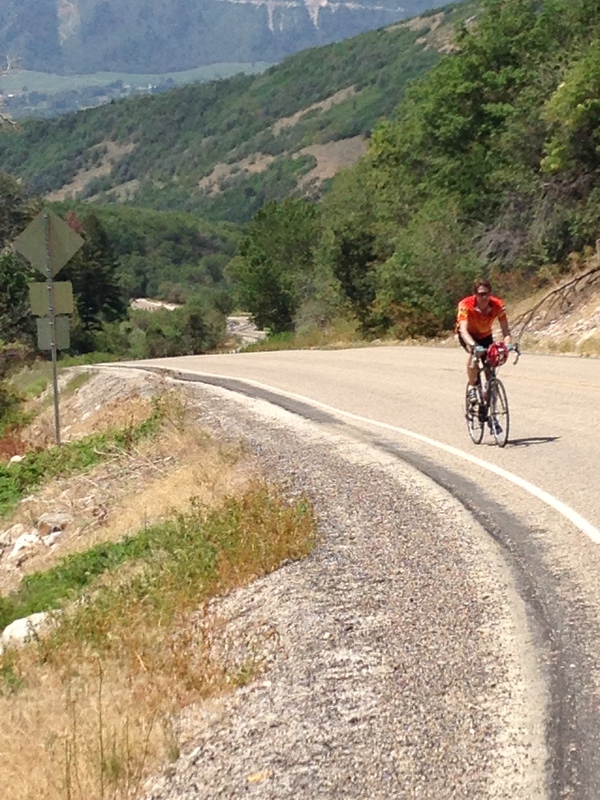 Update: Okay, so I’ve ridden in Utah since 2014, but again, doing Summerson climbs. Not that you care when I did them, but I will note the year for these later ones. 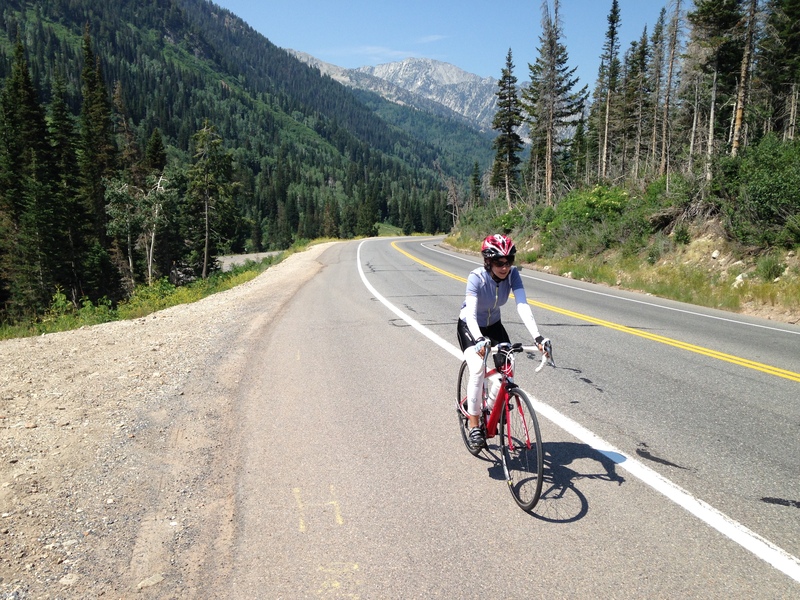 Big Cottonwood Canyon (#35, 3.01, 4,814′). A great climb that follows Big Cottonwood Canyon almost to the top, but just before the Brighton Ski area you turn left and climb out of the valley. This is the best part of the climb and gives you beautiful views. After some very steep sections interspersed with easier angles, you arrive at the top of Guardsman Pass. The first few miles of this ride felt a bit dangerous as we were riding directly into the sun. Little Cottonwood Canyon (#44, 2.90, 3,390′). I loved this climb. The canyon is beautiful, the road surface is excellent, and the views are wonderful. It was so good I rode it twice, once by myself and once with Tanya. Not my photo – and not the same time of year! Millcreek Canyon (1.52, 2,522′). A very pretty and wooded canyon, it’s very different to the more wide open and less vegetated canyons around here. For some reason it made me think of Lord of the Rings. Not nearly as difficult as the Cottonwood Canyons. Alpine Summit (1.96, 5,816′). This was a great ride. We rode Alpine Summit from the west side, then went down the other side, past Sundance (it surprised me to learn that the Sundance Film Festival is based in Park City, not Sundance) to Highway 189. Then we turned round and rode back the way we had come. The steepest part of the whole ride is the two miles back up to Sundance. 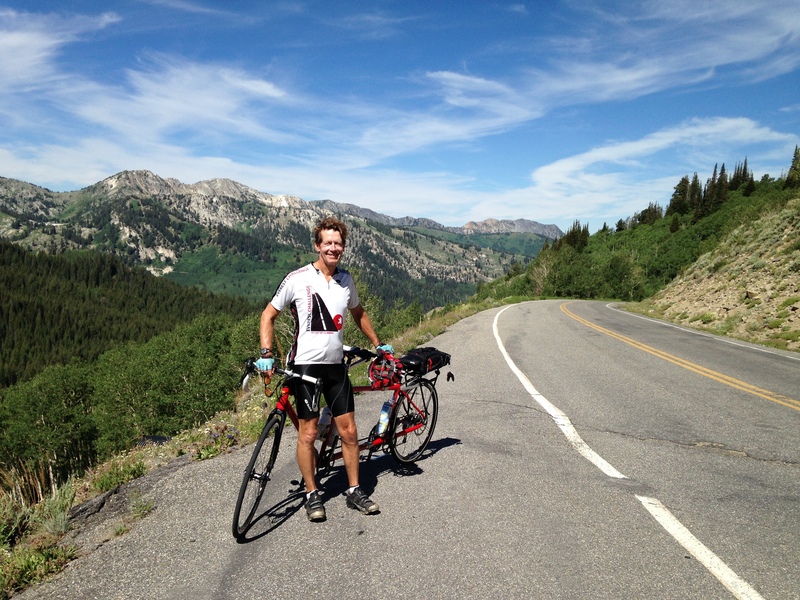 The scenery is really beautiful, with spectacular views of the Wasatch mountains. Empire Pass North (1.71, 2,094′). 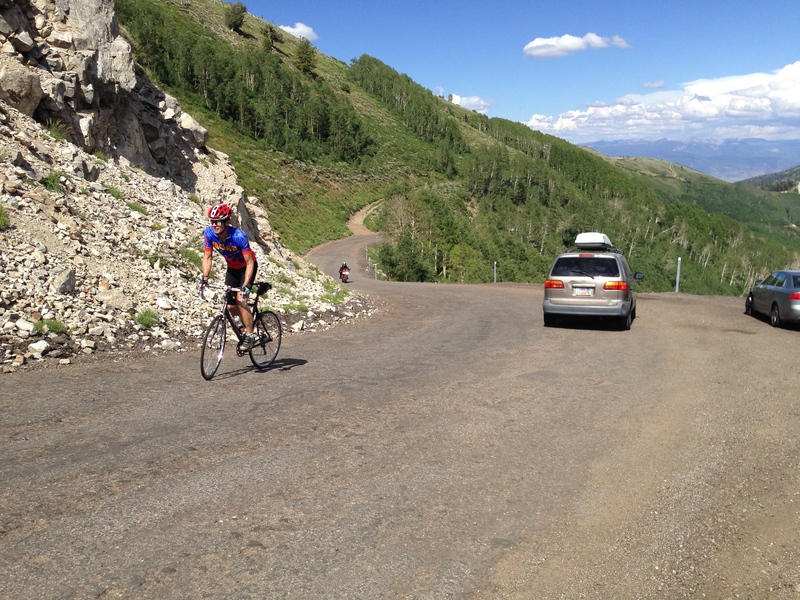 A short but steep climb out of Park City to the top of Empire Pass. It doesn’t have the feel of the great outdoors, but is worth doing if you are in the area. I agree. I was standing using a 34×32 gear and still barely able to move upwards. Guardsman Pass East (#10, 4.33, 3,948′). This is basically Empire Pass with a more difficult finish. 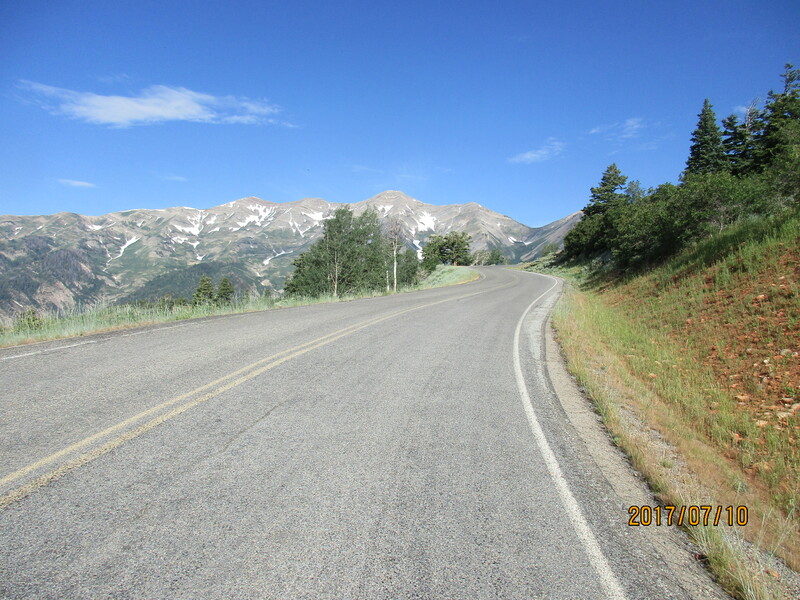 You do all the hard climbing on Empire Pass, then where Empire heads over to Park City, you instead continue another 1.5 miles up a very steep and rather rough road to the top of Guardsman Pass. If you do this you can basically say you’ve also done Empire Pass as the Empire finish is pretty easy. How could you not want to ride this after such a description? It’s definitely a good hard climb, quite relentless for a long way. 143 North (#33, 3.07, 4,339′). “A contender for the most difficult ascent in southern Utah,” according to Summerson. The first nine miles are reasonable grade, then things kick up for a couple of miles until you reach the small town of Brian Head. The road flattens out then gets steeper to the top. Not the most amazing climb but worth doing if you are in the area. Kolob Reservoir (#80, 2.45, 4,150′). Very different to all the other climbs described here because it’s in true desert country, just a short distance from Zion National Park. It’s very steep in places and with wonderful views of sandstone cliffs. We did it on a tandem, which was really hard on those steep sections. Definitely worth doing for the scenery. 153/Elk Meadows (Eagle Point) (2.31, 4,266′). Rode in 2017. Summerson starts a bit east of Beaver but you might as well start in the town. The first half is pretty easy as it follows the river valley gently uphill, then a bit after MM 10 you do two big switchbacks to leave the valley. Now the climb gets interesting and much prettier. After the second switchback you follow a shelf below cliffs then at MM 14 the road flattens for a couple of miles before rearing up again, with some solid 10-11%. Around MM 19 you reach the Eagle Point ski area and just after MM 19 turn left on Upper Meadows Road. This starts steep then eases off and about a mile up the hill you reach the finish at the Skyline Lodge parking lot at the top of one of the chairlifts. 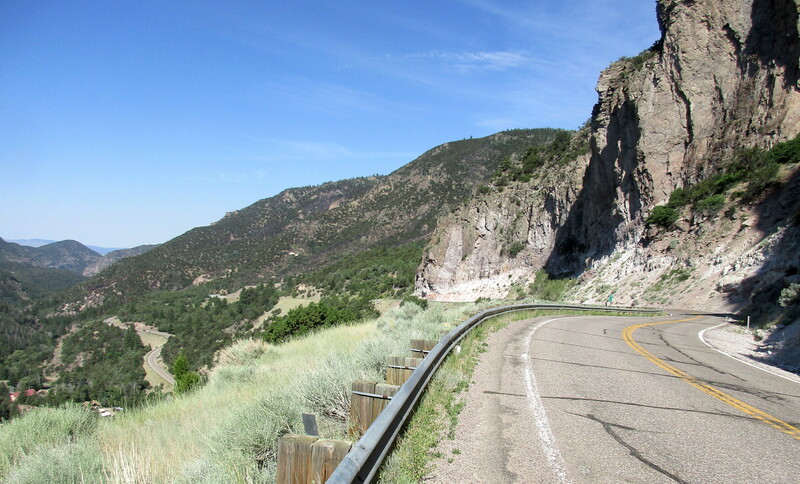 Nebo Loop Scenic Byway. This road bypasses the hulking mass of Mt Nebo to the east. 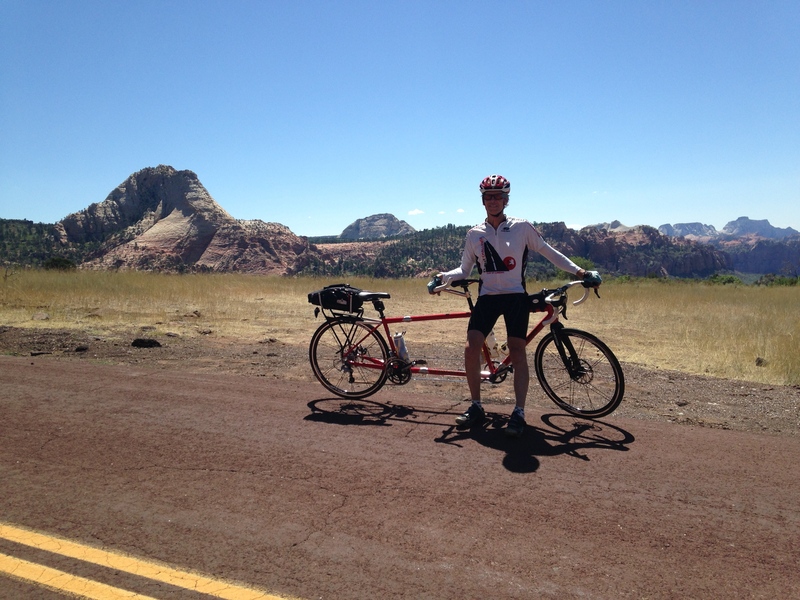 You can do the climb from Nephi or Payson, or do an over-and-back, giving you two climbs for the price of one. This is what I did on 7/10/17, starting in Nephi. It’s about 81.6 miles with 9,750 feet of climbing. 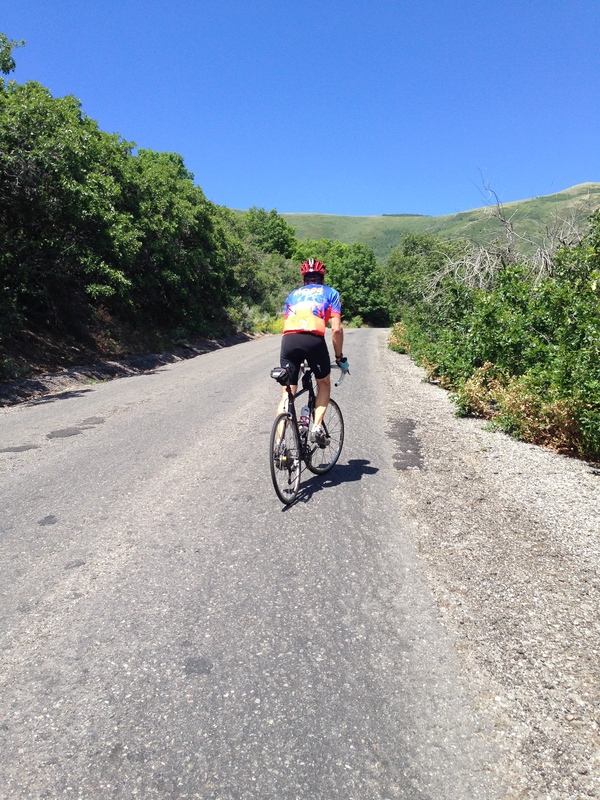 The first few miles from Nephi are gently uphill, then just before mile 5 turn left on the Nebo Loop Scenic Byway. The next three miles are also gently uphill but then the gradient increases. It’s a lovely climb, interesting with gorgeous views of the east side of Mount Nebo, and plenty of steep climbing, sometimes between 8-9% and sometimes 10-11%. You reach the summit about 18.6 miles from Nephi, or 13.8 miles from the turnoff. Now head downhill towards Payson. There are some vast panoramas as you descend, but I thought the south side was more interesting. Turn around once you reach the houses in Payson and retrace your steps. I found the climb from Payson less interesting and more tedious. This is a long ride so having enough water is important. Fortunately, about 10.7 miles from the top there is a turnoff to the left to the Payson Lakes Campground. As you pass the campground pay booth, take the left fork, then in about 50 feet there is a water tap on the right. Obviously you can do this out-and-back from either side but I recommend doing it from the Nephi side. This side is steeper and better to do while you are fresh. Also, it’s a more sensible direction if you plan on refilling your water bottles at Payson Lakes Campground.